Seven chefs make Easter dinner. Cameras captured the confrontation between police and Ismael Diaz and Alberto Nunez-Horta, who are accused of impersonating federal agents at Versailles restaurant in Little Havana. NBC 6's Willard Shepard reports. 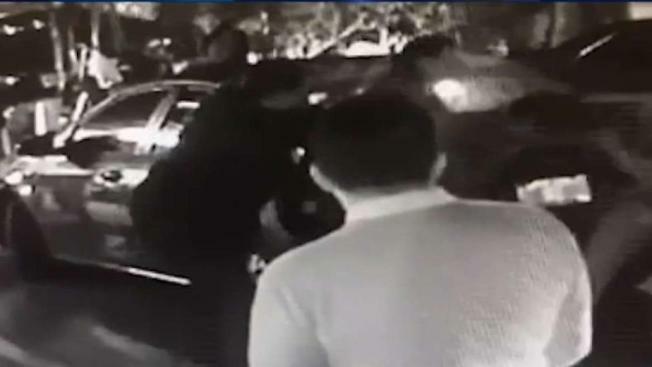 Newly obtained surveillance footage shows the confrontation among Miami police and two men accused of impersonating federal agents at Little Havana's Versailles restaurant earlier this year. Police say Ismael Diaz, 51, and Alberto Nunez-Horta, 48, were arrested back in January and faced charges of impersonating a police officer, assault and battery on a law enforcement officer and disorderly conduct. The restaurant says for several days at various hours, the pair spoke with customers and portrayed themselves as agents with the FBI. As part of the alleged ruse, they brought a dog that looks like a police dog with them. When told they couldn't come inside with the animal, the manager can be seen on video speaking with them, and at one point, Nunez appears to flash identification. The surveillance NBC 6 obtained shows the moments when the manager asked three Miami detectives who just happened to be at the restaurant to get Diaz and Nunez to leave. The video shows words are exchanged first with Diaz. Nunez is seen waving his hands, and then the fight begins. Police say Nunez choked and punched the detective before he could fight back and that he also jumped in and struck the detective while holding onto his dog. The fight is seen spilling down into the parking lot. Another camera also captured Nunez approaching the detective and, police say, becoming verbally aggressive before the punches started flying. The two other Miami detectives are also seen getting into the fray. The charges for impersonating an officer were later dropped for both men. They both entered not guilty pleas for the rest of the charges. Diaz is currently in jail, and his attorney did not want to provide a comment. NBC 6 reached out to Nunez' attorney but have not heard back.